Pro tips for properly warming up your muscles for peak performance. By Cory Smith·	 3/25/2015, 11:50 a.m. If you’ve ever run a race before, odds are you’ve seen some runners jogging, jumping, marching, and even sprinting before the gun goes off. Perhaps you thought to yourself, “They’re elite runners. I don’t need to do that stuff — I’ll save my energy for the race.” While it’s true that you most likely won’t need to be as thorough as the elites, everyone needs a good warm-up, especially before a longer-distance race like the Broad Street Run. In fact, I would argue warming up is absolutely essential for peak performance and makes handling those first few miles a bit easier. A proper warm-up prepares your muscular, cardiovascular and nervous systems for the demands of running. The goal of a good warm-up should be to raise your core body temperature, loosen up and increase blood flow to your muscles, and trigger the neural pathway between your brain and muscles. My high school coach, Jim McCoach (Yes, that is his real name. ), would always tells us we should aim to break a slight sweat during our warm-up, and that advice is still a good guide. While you won’t need to warm up before every run, it should become part of your normal training program. On easy running days, you can skip the warm-up and let the first 10 to 20 minutes of easy running act as your warm-up. However, on days when you’re planning on running a bit harder or longer, you’ll definitely want to pencil in some time for a proper warm-up. Step 1: Five to 20 minutes of walking or running. Step 2: Five to 15 minutes of dynamic stretching and drills. You’ll want to practice your warm-up routine in your training so when race day comes you know exactly what works for you. Play around with different variations of exercises and durations till you find one that you like and works for you. Once you’ve got one, make it a ritual you perform before every race or hard workout. Here are some further guidelines on how to perform a proper warm-up, including stretching. Vary the duration of your warm-up according to the duration of your race. You’ll want to limit the amount of energy you spend warming up depending on how much time you’ll be running. Use length of time you’ll be running as a guideline. The longer you’re running the shorter your warm-up. 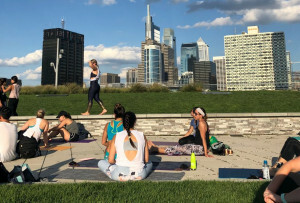 For example, if you’re planning on running over 1:45 at Broad Street, limit your warm-up to a light five-minute walk/jog and some dynamic stretching drills. Use dynamic stretching before exercise. Research has found you should avoid static stretching (i.e. holding poses for eight seconds or more) prior to exercise in favor of dynamic stretching. On race day, stay warm in the corral. This is an important one that I find most runners get wrong. If it’s chilly out (check out these historical race day temps), don’t stand around in shorts and a T-shirt waiting for the race to begin. Wear pants and long-sleeve top you’re willing to toss away at the start of the race. Look to keep the clothes on until just before your start. In most races, the tossed clothing gets donated. Reduce muscle tightness and soreness with lunges. Running on sore muscles is fine and even encouraged. To help reduce soreness, ease tightness and activate your glutes, try a series of forward and side lunges before you run. Check out the lunge matrix for a complete guide. If you’re stuck in the corral waiting for 15 minutes or more, do a series of lunges to warm-up your legs. Cory Smith, a Philadelphia based running coach, shares his expert advice as an American Cancer Society DetermiNation running coach; founder of Run Your Personal Best, a private running-coaching business; and head cross country coach at Penn State Brandywine. He is a USA Track and Field-certified coach and a 4:03 miler. As a student athlete at Villanova, Cory was an NCAA Division One Regional and National Championship qualifier. Contact Cory at cory@runyourpersonalbest.com. Read all of Cory’s posts for Be Well Philly here.